Dinosaur bone wedding band and engagement ring set with a princess cut white sapphire set in sterling silver. 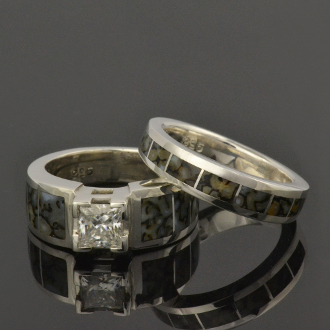 Each side of the handmade engagement ring is inlaid with three pieces of fossilized dinosaur bone. The dinosaur bone in this ring is a gray base color with black webbing and some taupe colored cells mixed in. The center gemstone is a princess cut white sapphire weighing .75 carats held securely in the mounting by 4 corner prongs. The ring (style CS028) measures 7.5mm wide at the top and tapers to 4.5mm at the bottom. This dinosaur bone wedding ring set would make a unique and affordable alternative to a traditional diamond ring. Moissanite is also available as a center stone choice for this ring. The matching wedding band (style W134) has 7 pieces of matching dinosaur bone to complete the bridal set. The matching wedding band measures 4.5mm wide with a very slight taper to the bottom. The engagement/wedding ring shown in the photo is a size 6 3/4 for scale but will be made to order in your ring size in 4 to 6 weeks. This ring is also available with other inlay materials and other center stone choices. Contact me with special requests or for more details and price quotes. The last photo shows a matching man's wedding band that is also available. The Utah dinosaur gem bone in this ring came from the Colorado Plateau and was a living animal during the Jurassic Period around 144 to 208 million years ago. The dinosaur bone we use in our silver rings is usually referred to as “gembone”. It is actually no longer dinosaur bone but is a combination of minerals that replaced the bone structure over time as the bone became fossilized. Dinosaur bone is found in a rainbow of colors with the webbing color and cell size varying greatly from piece to piece. The varying cell size and colors create some truly unique patterns and virtually one of a kind pieces of dinosaur bone jewelry. The fossilized dinosaur bone can be composed of many different minerals including agate, jasper and calcite. The gembone color is determined by the combination of minerals present when the fossilized bone formed. Some colors are more rare than others with multicolor cells in a nice pattern being the most sought after. High quality dinosaur bone has a hardness of 6-7 on the Moh’s scale. Top grade gem dinosaur bone is eventually going to become impossible to get because, as you might have guessed, they aren’t making it any more.